One of these days you'll want to stand back, as I am working to ARM myself with another Surface RT! Matthew Slyman has become quite the Blog commenter recently, giving Yuhong Bao a run for his money! > "The trouble is that it only can save what it can read; and making it able to read them is complicated...."
So, read them as a plain string, and write them as a plain string. Beginners won't notice the dummy "functionality" is there. And advanced users (who will have put those annotations there on purpose) won't curse MSKLC for stripping them out! At least, one might have an option in a MSKLC v1.4b, to NOT strip out the extra chained dead key information? Now I myself am a conscientious objector to the creeping normativity that this XKCD comic implies. Though I am working on a 1.5 MSKLC update that just might take a swing at solving some of these problems! I'm developing a family of US-DVORAK-based keyboard layouts that include comprehensive extra sets of diacritics, accents, scientific and mathematical symbols via dead-keys. The end result I want is a 100%-key-compatible drop-in-replacement for the built-in US-Dvorak layout, which merely contains extra features that existing Dvorak layout users can graduate into. Also, based on the excellent prior keyboard-layout work of Scott Horne; I'm further developing a range of such layouts for LATIN, GREEK, CYRILLIC etc. ; including archaic versions of these scripts (with approximate phonetic equivalence between all of these, to aid language-learning, multilingualism, and to promote Dvorak layouts which are pragmatically better). Only... ONE blocker issue if I want the end-result to be user-friendly... I'm using Windows 8 Pro. In previous versions of MS Windows, I had problems with inconsistent treatment of keyboard shortcuts between different application programs (especially in MS Word) when using the US Dvorak layout, or when trying to force Windows to recognize my alternative CTRL-[?] shortcut mappings via MSKLC. I NEED YOUR HELP... Before I complain/ ask for help, I must THANK Microsoft for the noteworthy improvements that have been made to language/layout selection ergonomics in Windows 8. I'm really impressed with the changes. Windows 8, quite rightly, labels the keyboard layouts according to whether they're broadly based on QWERTY, AZERTY, Dvorak, etc. The keyboard shortcut mappings (CTRL-C, CTRL-V etc.) generally follow the pattern belonging to the keyboard layout family (so that CTRL-C is for COPY even if you're using Dvorak, which I couldn't get to work in Windows 7 etc.) Unfortunately, I cannot work out how to label or meta-tag my own custom-generated keyboard layouts, to let Windows 8 know that my custom layouts are based on Dvorak! Besides MSKLC, I've tried KbdEdit Premium; with similar results for this particular feature: In the Windows 8 language/layout popup/control panel widget, my layouts are simply listed as "Keyboard", rather than listed as belonging to any particular family (QWERTY, AZERTY, Dvorak etc.) Even the author of "KbdEdit" has looked into this and cannot yet figure out how to meta-tag my layouts! Will you help please? How can I meta-tag my custom layouts to let Windows 8 know that I want to use the Dvorak-based keyboard shortcut mappings? I'm not sure whether MSKLC 1.5 will be able to do much in that vein, though. Although I formally requested that the owners of the >= Windows 8 optimized keyboard layouts give me a way to access, modify, and author them, the folks in Ireland didn't seem especially interested in helping me on that effort. I think I need to have a chat with some people in Ireland now, in preparation for my MSKLC 1.5 Passion Project described previously in Developing for a jailbroken Surface RT -- dare I disturb the universe?, That MSKLC with a jailbroken Surface RT thing? I dared to disturb the universe, and...,, 2nd amendment issues don't apply; I'm not ARMed!, and of course the earlier What I'd do with my 'Microsoft 20% time'. I guess this might be a good time to start getting busy! I've fixed the shortcuts (bringing them into line with the built-in US Dvorak layout), using advice from another of your blog posts (more details later). Some scripts (cherokee, cyrillic, greek) use identical or very similar characters to latin script. This may cause confusion (especially so in the case of Cherokee). Couldn't the On-Screen Keyboard use different colors for latin and cherokee letters? Mr. Kaplan has given me some constructive feedback on my keyboard layout in relation to MSKLC validation warnings, which I am working to incorporate into the design. @Azerian: that's an interesting idea, I can see how that might be useful for other applications, such as display of international characters on the address bar of a web browser, to help prevent phishing attacks using similar-looking domains. OK, the hyperlink in my first comment here now downloads an error-free version of the keyboard layout! 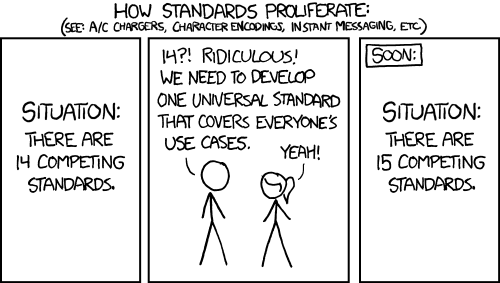 In respect of the "How Standards Proliferate" cartoon from XKCD, in case anyone hasn't guessed yet: this is the main reason why I'm insisting on making my new keyboard layout a backwards-compatible drop-in-replacement for the standard "US [English] Dvorak" layout.